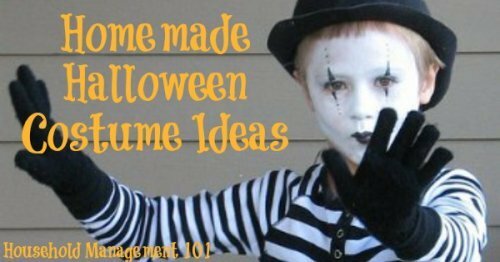 Are you thinking of making your kids homemade Halloween costumes this year? If so, check out these ideas and pictures for making your own. 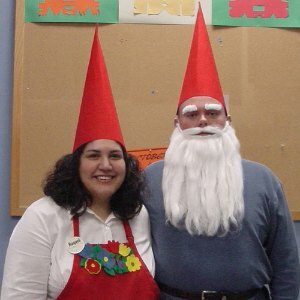 I started searching in Flickr Creative Commons and this is what I found, and since this article was originally published several readers have also sent in their own costume ideas, which I've also added. 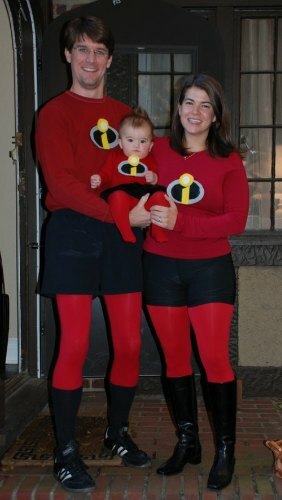 I always like the idea of family costumes, because everyone can get involved that way. Here is a great example I found, and believe it or not this was all homemade. Basically any superhero team, such as Justice League, Power Rangers, Marvel Superhero Squad, etc. 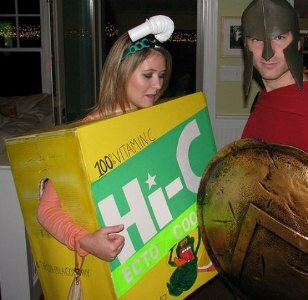 I loved all these pictures of people dressed up like ordinary objects. These are really popular for parties, because of their originality. For example, I recall seeing someone dressed as a mailbox at a Halloween party I went to years ago, and I still remember it. 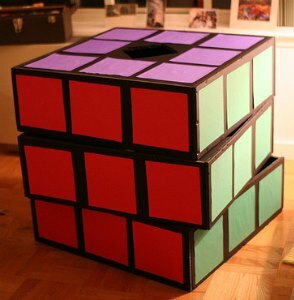 Finally, here are some pictures of the most awesome everyday object I found -- a Rubix cube. 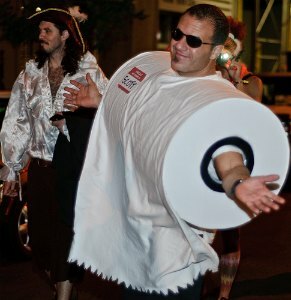 First, here is a picture of the completed costume. 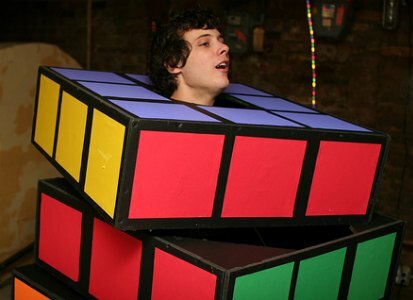 Next, is a picture with the Rubix Cube costume on. In addition, if you want to see the full set of pictures of how he made this costume, he has posted them all here. I love this idea for legos. Just a box with some attachments for the pegs, and voila! These photos were submitted by a reader, Shani. Here's another idea from a reader, Ali. 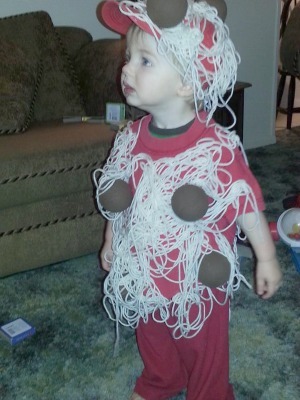 Dress your child up as spaghetti and meatballs, with some string and some spray painted foam balls. How adorable! The sky is really the limit when it comes to imaginative objects to use as homemade halloween costume inspiration. 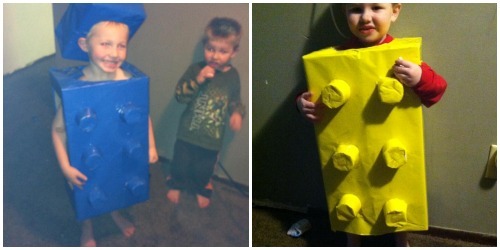 Kids love to pretend to be animals, so these homemade costumes are always a hit. 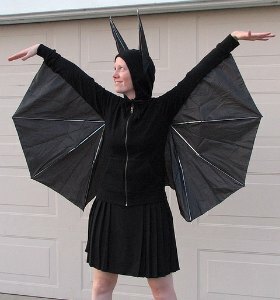 Here is an example of a homemade bat costume which uses old umbrellas to make the wings. Pretty ingenious, right? Here are the instructions for how to make this costume, if you really like it. 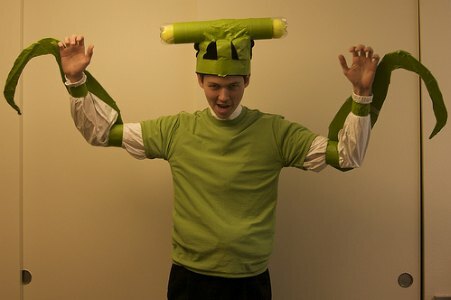 Another animal example is this praying mantis costume. Now what little boy (and some girls too!) 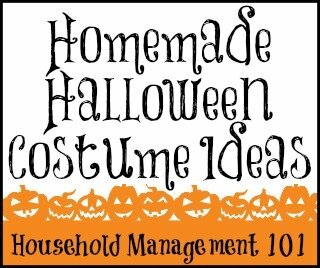 wouldn't like a homemade bug costume for Halloween? Here are some more I found that are just for fun, but each of them is really cute. 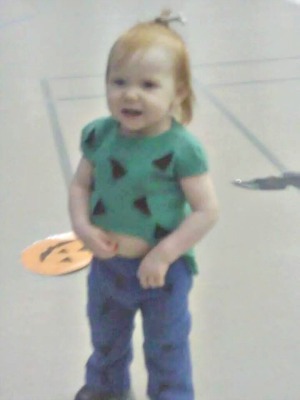 First, here's a picture of a simple Pebbles costume, from the Flintstones, sent in by a reader, Julie. Julie explained, "Pebbles!! I took fleece and doubled up the layer since it's cold here!! I cut the shape by laying it under a well fit shirt and pants and drawing the outline with some extra room on the outside. Then I cut the black shapes and sewed them and bought the bone for her hair in a multi pack for cheap. I didn't have to make it nice since it's fleece and the and the shapes were dark colored. Her hair is more red than this, the lighting made it look blonder. Perfect costume for her age (1)." Next is a photo sent in by another reader, Cheryl. 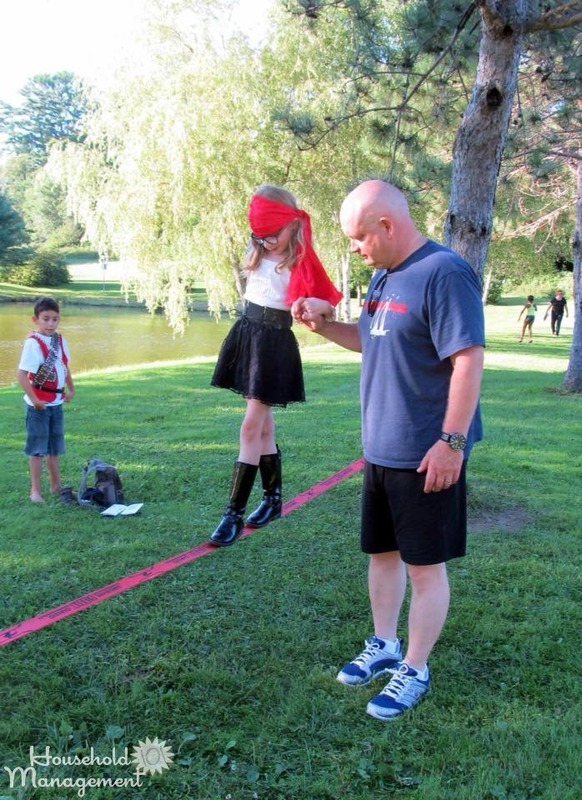 Cheryl said, "My kids love being pirates and put the outfits together themselves." Another reader, Duana, also sent in her own photo of her toddler, which you can see below. 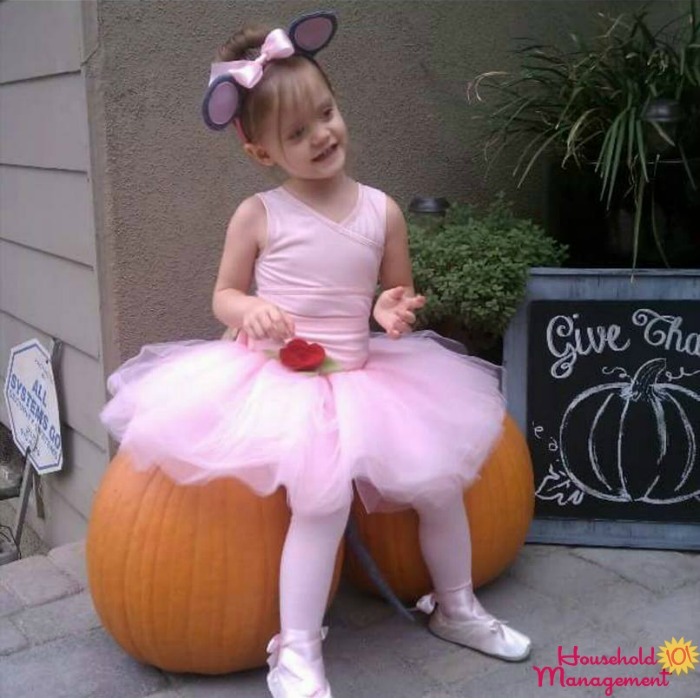 Duana explained, "Last year she was Angelina Ballerina, homemade tutu, ears and tail." 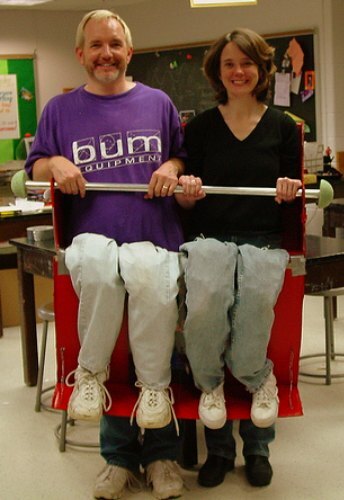 I also thought this costume where they look like they are riding a roller coaster is really neat. 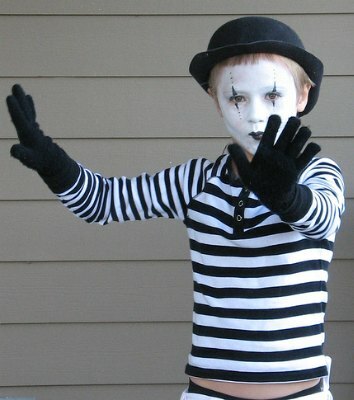 Finally, I thought this mime costume was also really well done, and looks easy to duplicate. 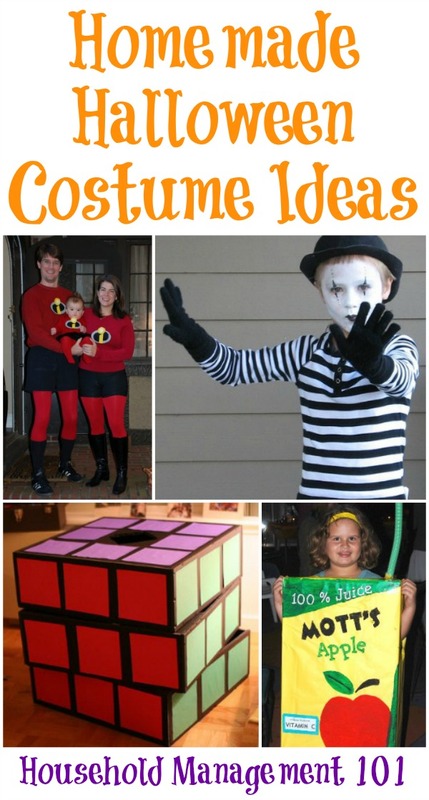 I hope these pictures have given you some good ideas for what kinds of costumes you could make with items around your home for yourself or your kids this Halloween! Did you know, some costume selections are safer than others though? And you need to consider how the costume is seen by others (especially drivers) in the dark, such as when you're kids are out trick or treating. Make sure to check out these Halloween safety tips to make sure you make your child's costume as safely as possible!